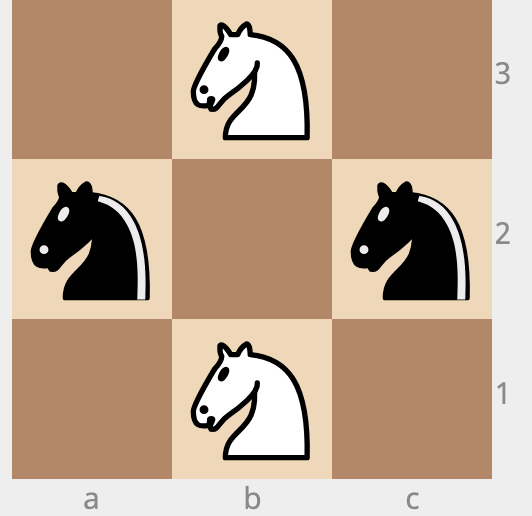 There are 2 white knights and 2 black knights positioned at a (3 X 3) chess board. Find the minimum number of moves required to replace the blacks with whites and the whites with blacks. I tried the above in 19 steps and reckon that I'm wrong. Please help !! What is your take on this? Here is my solution, but it seems that my answer takes longer number of steps. We want to move white from $1\&7$ to $9\&3$, for black from the $9\&3$ to $1\&7$. It is straightforward that the minimum movement we should take is shifting them all $4$ times to right or left. Hence, $4 \times 4 = 16$ moves is the optimal one. Since the path is cyclic, there are working positions reached along the way too, of course. I can get you down to 16 moves. I don't know if I can do any better. Eight moves total, so far. Not the answer you're looking for? Browse other questions tagged logical-deduction chess .